It’s not that the blackbird is unusual. In fact it is downright common although the colorful picture that the males make with their red-and-yellow shoulder badges is still pleasing to the eye. By comparison the female is nondescript and her behavior mirrors her camouflage of color. The behavior of the male reminds me, on the other hand, of a college frat boy. One reason is because the male redwing is territorial and very aggressive in protecting its boundary. I have seen them attack and chase crows, hawks and even ospreys. 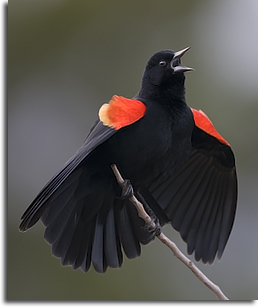 They also are very vocal and have been known to dive-bomb people when they approach active nesting areas. I can personally attest to this by the way and strongly recommend avoiding kayak excursions into an active territorial area. Another is their common tendency for polygamy where one territorial male redwing will have many female mates. Now guys, don’t take offense here, I am not casting one-sided aspersions. It turns out in the end that many of the young end up being sired by an individual other than the territorial male. 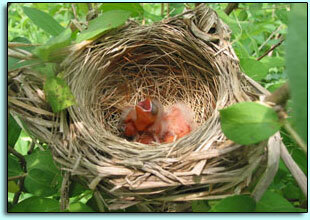 Redwings build their nests in a variety of habitats though a marsh, swamp, or wet meadow appears to be preferred. 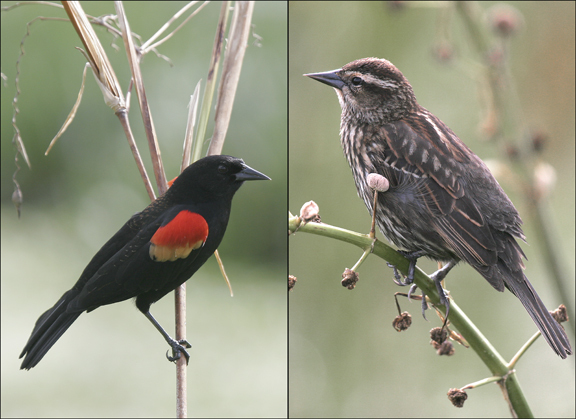 The female will weave an intricate nest platform out of cattail, rush, sedge, buttonbush, willow or other vegetation. They prefer this water-loving vegetation for the placement of the nest as well. Now, I have seen other signs that I equate with spring such as full thaw, fog, and burgeoning leaf buds. Then there is the sweet sound of the black-capped chickadee’s spring song of fee-bie or sweet-ie. I have also observed the gray squirrels (Sciurus carolinensis) cutting and dropping the early buds and/or twigs from the silver maples (Acer saccharinum) in my neighborhood which means that the sap is running. The squirrel like us has a sweet tooth and when the sap begins to flow they clip the branches and buds to lick the sap from the cuts that they have made. So don’t forget to get out and enjoy the spring air, but watch out for falling branches.